In this class, I will walk you through the hows, whys, and wherefores of my Sweet Trash Journal Practice. 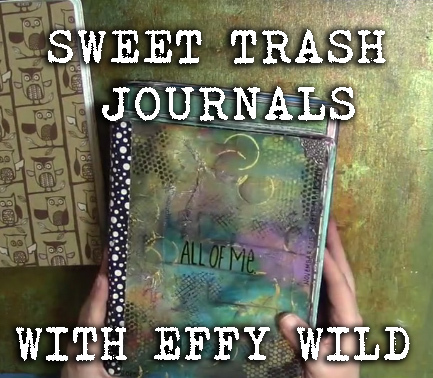 The Sweet Trash Journal is my DIY Smashbook and has become an integral part of my daily life. I put everything in this journal, using various mediums and methods to ‘smash’ all my art, journaling, scraps of things, photographs, my planner, etc. It is a gorgeous testament to what I’m doing with *all* of my life, and contains *all of me*. It starts out as ‘trash’ – just a cheapo composition notebook, but as it ‘blooms’ with everything I smash into it, it becomes treasure. This class is free, but tips are always appreciated! All students in this class will be added to my e-list, which I use to announce new classes, and send out coupon codes to my beloveds. This list is my way of staying in touch, and providing you with all the information you need to get into new things as I release them. Stay subscribed for discounts & fresh Effyness.